Situated on the banks of the Conwy Estuary, this reserve is a great place to visit and ideal for a day out with children in winter or summer. There are paths and boardwalks running throughout the reserve, and some of these are suitable for wheelchair users or for people with prams or pushchairs, allowing access through the reed beds and very close to the water. There are also two hides with views across the estuary. The nature reserve was created in mitigation for the loss of habitat resulting from the construction of the Conwy tunnel for the A55 Holyhead – Chester dual carriageway road (commonly referred to as the Expressway). This nature reserve is managed by RSPB. Leave the A55 at the exit signed Deganwy, and you will find the entrance to the reserve directly off the roundabout above the main road. The paths through the reserve are level and firm, but wheelchair users and people with prams or pushchairs should keep to the loop closest to the visitor centre. This part of the trail has two bird hides and also a special children's section. There are information boards throughout the reserve and an onsite Visitor Centre with toilets, shop and café. For disabled visitors there is dedicated parking and a ramp into the visitor centre; there are also some special wheelchair-adapted picnic tables. 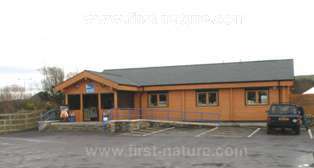 The visitor centre complex has a large panoramic window overlooking one of the reserve's lagoons, and there are telescopes for use by visitors. More than 200 birds species have been recorded at Conwy, and on a recent visit we joined one of the guided walks with RSPB wardens who were able to point out the various birds of interest to be seen in the reserve that day which included a Water Rail. One of the great things about a visit to a reserve such as RSPB Conwy is that, no matter what time of year you go, there is always something to see. In spring the migrant birds start arriving and you can expect to see Sedge Warbler, Whitethroat and Lapwing among others. Nest building activity starts in earnest and there is an increase in the amount of birdsong to be heard all around the reserve. 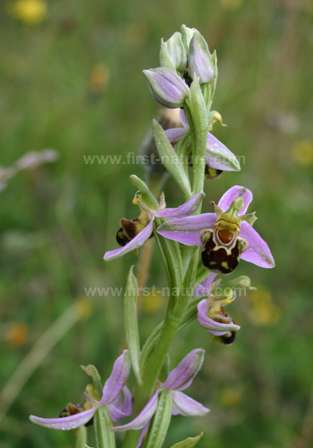 Below: There's more to RSPB Conwy than birds - there are Bee Orchids, too! Some special birds breed at RSPB Conwy including Little Ringed Plover and of course the Lapwing, once so common throughout Britain and now such a rarity. Other breeding species include Sand Piper, Sand Martin, Red Shank, Coot and Oystercatcher. In the reed beds there are Reed Bunting, Grasshopper Warbler and Sedge Warbler. In summer Little Egrets (Egretta garzetta) arrive, while on the lagoons there are plenty of young ducks and waders to delight us on our visits. 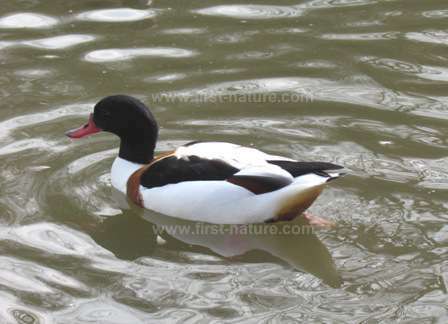 Shelducks breed in nesting tunnels that have been constructed specially for them by the staff of the reserve. Spring and summer are also the best times of year to see some of the more than 270 wonderful wildflower species and other plants that grow in the reserve, and to enjoy the butterflies and other insects which come to enjoy the flower nectar in exchange for a bit of assistance with pollination. Twenty-two butterflies species have been recorded at RSPB Conwy and 11 dragonfly and damselfly species also make their homes there. There is always a chance of seeing some mammals at the reserve, and Otters, Weasels and Stoats have all been recorded there. Autumn is equally interesting with passing migrant birds calling in en route to their overwintering territories. At the same time grassland fungi put in an appearance. However, the spectacular evening flying displays by the 20,000 or more starlings that roost in the area have to be the highlight of this time of year; the displays continue well into the winter. In turn, this abundance of food attracts predators such as Peregrines, Sparrowhawks and Merlins. Winter is the best time to see birds that overwinter on the reserve: Eurasian Wigeon, Common Teal, Gadwall, Pintail, Shoveler and Pochard are among the many species you can expect to see there.